When I first saw the QuickKutz L Letterpress earlier this year I was troubled (as were many of the other professional letterpress printers I knew). It seemed like it would cheapen and denigrate our 550 year old craft and confuse people who are used to high quality letterpress printing. If you comb the internet, you might still be able to find some of my irate comments on blogs denouncing the machine. But rather than writing the machine off, I’ve recently tried to come to terms with the machine. Whether I like it or not lots of people will be buying this press and hoping to have fun printing. (They’ll probably have a lot more fun than many of us professionals making a living by printing!) Some of the new printers will hope to sell quality printing made from it. It’s really in everyone’s best interest to make sure these new additions to our tiny letterpress community have the best materials and techniques at hand…so that they make letterpress look as good as possible. I don’t want letterpress to have a bad name! My hope is that by sharing some time-tested letterpress techniques (that aren’t in the manual), I can help L Letterpress printers from getting discouraged. And without help, I think the press can be very discouraging. Eventually, my hope is that these new printers will use the L Letterpress as a stepping stone to a more substantial press, say a 13×18 Heidelberg Windmill, and that they will help preserve the craft and equipment for future generations to cherish. 1) Throw away the supplied ink roller and buy yourself one that will work. Why? 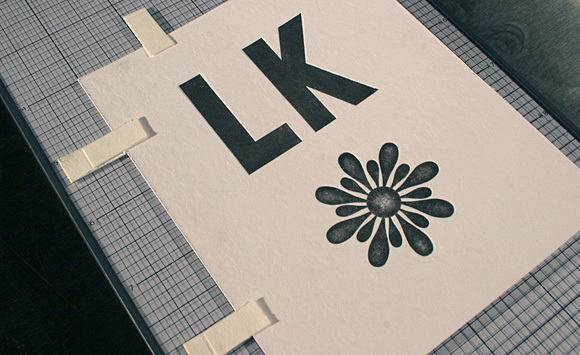 This is the most important thing you can do to improve your printing on the L Letterpress. As with a big cast iron press, you will never get quality printing without quality rollers…and the manufacturer has not shipped a quality roller. The manufacturer’s ink roller was too hard for letterpress printing. It wasn’t even round, and had “dry spots” when I rolled out ink on an ink slab. How to do this? Purchase a printmaking brayer. You can get these for under $10 from your local art store, but I’ll recommend a few that are a little more “up-market” so that you can be assured your roller will work. You’ll see why I’m suggesting such a wide (6 inch) roller in my third tip. Also, you’ll probably want an ink knife (shown in the background of the photo above) from a hardware storeâ€”check the paint section. This should only cost you a couple bucks. I’ll post shortly with some more specifics on how to ink more consistently. Start here, though! 2) Throw away the supplied plates and make yourselves custom KF152 photopolymer plates. Why? With just two impressions on the L Letterpress, we had shattered the plastic plates the manufacturer had supplied. A quick Google search showed that we were not alone. Clearly, the plates that ship with the press are made from a material that is not suited to the pressure involved in letterpress printing. Thankfully, we have been making custom photopolymer plates for years that do withstand the pressure of letterpress printing. Our plates are resilient and bounce back after each impression. They won’t shatter if you handle them correctly (keep them out of light when unused and sealed in the ziplock bag provided). How to do this? Order letterpress plates from us! Our plates are designed to handle the stresses of letterpress printing. Just request the KF152 plate material from our online order form. Our plates come with adhesive backing already on the plate and with a letterpress-printed proof to show what the plate will print like when you startâ€”and when you finishâ€”your printing! You’ll receive them sealed in a bag, so all you have to do is remove them, peel, and stick. Please note that every plate we made is custom, and we don’t have a catalog of stock plates. We just ask that you send us a PDF or a file suitable for graphic design (AI, EPS, etc.) and we’ll ship you back a plate of what you see on the screen. Also, read over our tips for file submission, which has detailed instructions on preparing custom artwork for letterpress. Real quickly: make sure everything is 100% black, line art, crisp. Feel free to contact us with any questions or concerns you might have about sending us custom artwork for your L Letterpress! 3) Use roller bearers to ink your plate consistently. 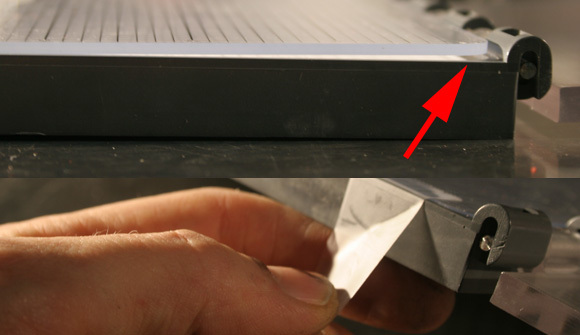 You can see that two thin strips of plate materialâ€”which are the exact same thickness as the plateâ€”are supporting the ink roller on either side of the plate. This keeps the roller parallel thereby keeping it from exerting too much pressure on the plate. You’ll know you need to do this if your printing appears splotchy, bloated, or isn’t crisp; it will probably never be crisp without roller bearers unless you are superhuman! How to do this? There’s no additional costâ€”how about that? Prior to shipping your plate, we have a border around the plate material that would make perfect roller bearers. We usually cut this off prior to shipping the plate out because most people don’t ink by hand. 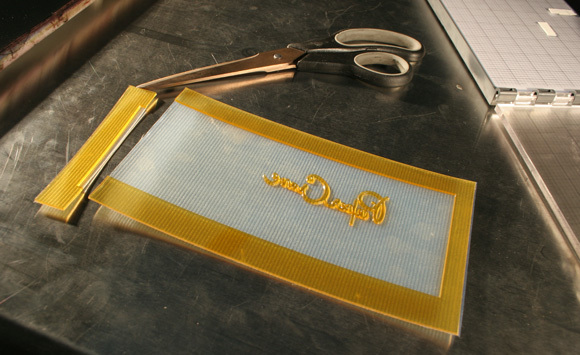 You can simply request that the plate is not trimmed down when you place an order, which will give you strips of material which you can cut down to place alongside your printing plate. 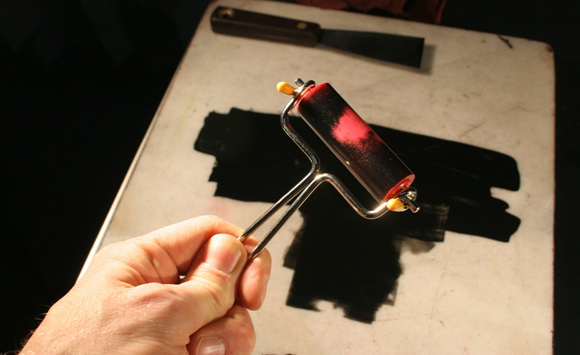 Ink up with the roller bearers perpendicular to the direction you’re rolling the roller. When you’re done inking for each print, remove the bearers and set them aside to use on the next print. It’ll add a few seconds to each print but it will improve your printing considerably! Make sure to peel off the inked-up bearers when you go to pull your print (you don’t actually want these to go through the press). You can put them back down when you’re ready to ink up your next print. 4) Throw away the sponge foam for positioning the paper and use paper “gauge pins” instead. First of all, the foam pieces are not very re-positionable if I want to move them to align the printing. And secondly, the foam is very squishy so I can never be sure where the paper will rest. No letterpress printer in their right mind would use foam to hold their paper in position! We (printers) are accustomed to much more accurate placement of the paper because we have to print multiple colors in register on top of each other. If you’re planning on multiple colors printed on your piece, listen up! 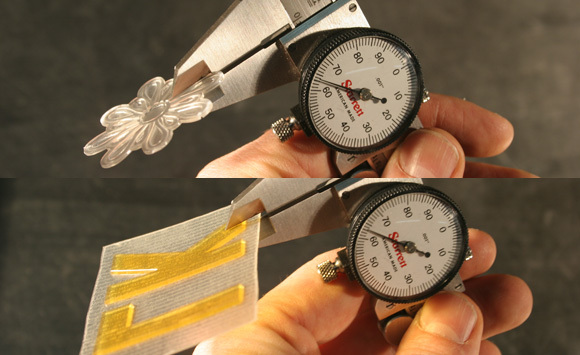 While it’s not a traditional solution, people have been making paper “gauge pins” (this is the name of the pins that hold the paper) for ages as a way to hold the paper in a tight squeeze. How to do this? I used a few pieces of the paper supplied by the manufacturer to make my gauge pins. 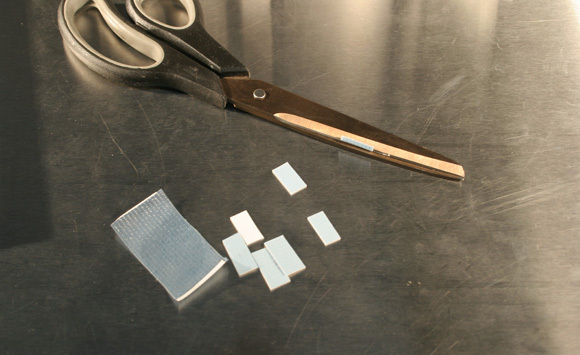 First I cut six Â¼ inch by Â½ inch strips. Then I used double-stick tape to adhere three of the tabs down the press bed where I wanted the paper to be. Finally, I adhered a thin strip on top of these tabs to hold the paper down and in place. The paper we print on will slip under these top strips and bump (securely) up against the bottom tabs. Since the paper is much thinner than the printing plate, you won’t see any indentation where the top strips overlap your piece of paper after squeezing them in the press. If you need to re-position the gauge pins, they peel up nicely and you can move them around to square up your plate to the sheet you’re printing on. Note: I used our Boxcar film adhesive for the double stick tape, which we sell as a way to mount printing plates. Since this is a re-positionable double stick tape, it fit the bill for this application as well. In this photo, you can see a comparison of our KF152 plate (top) with the cupped plastic plate that ships with the machine (bottom). You can also see how the paper gauge pins are holding the paper in position. 5) Tape the press bed down to keep it from moving around. Why? After a few impressions I noticed that the press bed itself was getting warped. At this point, I also realized that the press bed doesn’t fit perfectly into the machine, it actually has some slop in it. This means that the paper will not be registered to the plate every time you pull a print. To keep this from happening, tape down the press bed at the corners to keep it from moving around. How to do this? Scotch tape! Letterpress printers are very fond of this supply. Make sure you always have some on hand in your L Letterpress print shop. Note: I still noticed slop in the registration of the machine, because the hinge that the plate sits on also is pretty sloppy. I can’t figure out a quick or cheap way to improve this, so you’ll just want to be mindful of this looseness if you’re planning on printing multiple colors on top of each other in tight register. Always try to position the panel that flaps down over the plate in the same spot relative to the press bed. Printing on this machine is still going to take a lot of practice. How much ink do you put on the plate? How do you get multiple plates positioned correctly? I’ll post some more ideas to help you out with your printing in some upcoming blog posts. But for now, I just wanted to point out quick, simple ways to make good printing possible. It’s my opinion that the L Letterpress printing press can actually print wellâ€”if start by following these five tips when you start using it, and keep at it long enough. There is going to be a bit of a learning curve, but I hope these tips will at least get you started in the right direction. I hope this is helpful! If you’ve just bought an L Letterpress, welcome to the wonderful letterpress community! I think you’ll find you’re in good company. It’s a very fun craft to pursue and I hope that these techniques will help you get off to the right start. Let us know if you have any questions or concerns via the comments here and we’ll try to help you out as best as possible! 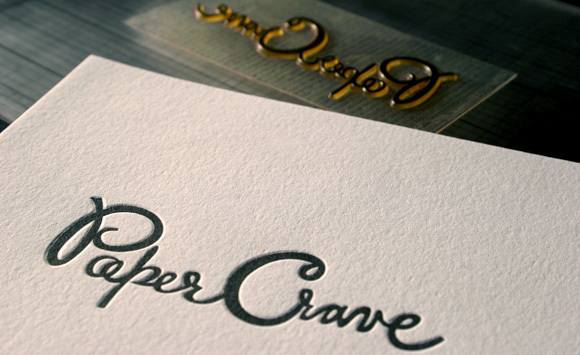 Here’s a nice print we made for Paper Crave. Her blog post got me started on this project. Thanks Kristen! This entry was posted in Letterpress Is Fun and tagged Cracking plates, DIY Letterpress, Inking problems, L Letterpress, letterpress plates, QuickCutz, Techniques by Aaron Glazer. Bookmark the permalink. That’s great! I’m going to read your article, but I’m very happy L Letterpress exists. I’m very interested in letterpress, but now I can’t afford (space, time and money) a real Heidelberg. I’m a graphic designer based in Milan, Italy, and it’s not so easy to find some really useful info about letterpress. I mean, here in Italy. So I think I will read your article, then I will buy L Letterpress to make some prints and someday in future – I hope – I will buy a real Heidelberg to print some good illustrations, posters etc. I like to take care of small projects, so I love letterpress more than any other kind fo print. Thanks for having posted this article! Thank you for posting a review on this. I was very curious and concerned with what kind of impact this new tool will have on the stationery industry. I’m glad to here that it is possible to print decent with the L Letterpress kit but I still have my reservations. I think I will keep using the C&P at my sister-in-law’s house instead. Perhaps this would be a good tool for printing business cards or smaller items but longer runs … I’m still not sure. Would I trust this tool for 200 wedding invitations? Eek, I’m not sure. Diane: Yeah I’d stick with the C&P if I were you! I wouldn’t want to print 200 impressions on L Letterpress, that would take most of the day when the C&P would get the job done in under an hour. Hand inking really tends to slow you down! There is indubitably a difference between professional works and those made at home. You make professional works with professional printers and I don’t think that, from now on, professionals will use L Letterpress. I think, instead, that someone interested in letterpress will try L Letterpress just to get his hands dirty. Just to understand the way it works. And perhaps in future someone will decide to go for a more professional printer. It’s just a new interesting tool, if you keep in mind that this kind of things are not professionals. IMHO. I had read some of your previous posts online and was truly feeling a bit of buyer’s remorse. I love the look of letterpress, but I know that I’d be wasting money to purchase a huge machine for which I have absolutely no training on how to work. I thought the L Letterpress would be a perfect imitation (though somewhat limited). Thank you for taking the time to show others in the craft world how to use the L Letterpress to the best of our ability. It’s truly appreciated. I had mentioned Boxcar Press on another blog about a week ago, because I knew that your company made photopolymer plates. I’m so glad that you’ll be able to make plates that work with the L Letterpress. I’ll stay tuned for more of your tutorials. I agree that this little machine won’t replace professional letterpress services but it does offer a glimpse for the curious of this wonderful art. I think it’ll be great for little one off projects too and like another commenter above, for those who want to get their hands dirty and explore. If nothing else, it’ll make people appreciate how much work it takes to produce a great piece of letterpress stationery! It’s nice to see that Boxcar is putting aside initial reservations and really making an effort to include newbies to the letterpress community. I haven’t bought one of the L Letterpresses yet, but I really appreciate the how-to. This new machine does bring up a good point – a lot of us can finally get our toes wet, but it is not the same. Does anybody know of any apprentice programs? Eventually I would love to find my own letterpress, but it seem daunting without any previous experience. I think the L will give us crafters a good starting point for now. I live in Raleigh, but would be willing to travel anywhere within a few hours distance. I would appreciate any advice you have! Can you buy the Epic 6 die cutting tool only? Everything else that comes with the L Letterpress starter kit you said not to use, except the clear packing mat with packing sheet. Is there an alternative to create the packing mat? Thank you so much for reviewing this machine. I like so many others would love to dabble in letterpress without the expense of owing one. I think that QuickCutz does sell the Epic 6 separately, however you will need the hinged clear board to use it for letterpress. I can’t imagine using this without the hinged part that holds the plate and the paper. You can see it better in this photo. Sorry! Best of luck! Thank you for a great review and tips! Thank you so much for all these great tips!. Came your way from the review done on Paper Crave. I have always been interested in Letterpress but never knew how to get started. I was wondering what the C&P is and would that be a better machine to invest in? Or is there another machine that would be good for at home use and eventually selling designs. Also have no clue how to design something to make a custom plate. I was reading your file tips page and I do have PSE5 and recently purchased PS CS4, but you need the files done in Illustor. Can you recommend any good online tutorials or sites that could help a newbie? I plan to peruse this site thoroughly! Jackie: Well a C&P is much more suited to running multiple prints, because it inks for you and prints a lot more quickly. But it’s also a lot heavier and usually more expensive. I guess the L Letterpress gives people without the space or money for a cast iron press a way to get started. Photoshop is fine for platemaking, all you need to do is create a high resolution Bitmap file saved as a TIFF or a PDF. Make sure the image size is 600 or higher in the Image>Image Size… dialog box, and the Bitmap is selected in the Image>Mode… dialog box. Usually you would convert the Bitmap via the 50% Threshold method, if it asks. The TIFF file type is great, make sure to save with compression. Also, we can accept PDFs from Photoshop. Photoshop is fine for submitting artwork to us for platemaking if you follow these easy instructions! It’s particularly well suited to scanned line art and images, which would be an easy way to get started on the L Letterpress. I hope that helps! We are located in Raleigh, NC and while we do not offer formal classes, we would be willing to work something out if you are interested. We have a 10×15 Windmill, a 12×18 ATF Little Giant, and a Nolan proof press. We will be getting a Vandercook No. 3 in the near future, and we have lots of smaller scale bindery/finishing capabilities as well as a platemaker. Drop me a line if you are interested. The “ink” that comes with the L Letterpress seems to be nothing more than oil paint in a tube with their packaging design. Is that really the case, or is it a special type of ink? If so, where can I purchase this ink in more colors if I don’t want to buy theirs or mix their colors to get a desired look? Brittany: The ink is a little runnier than the letterpress ink we use at Boxcar Press, but it’s not bad. It worked fine for my work and I don’t think it’s paint. We sell Van Son Rubber Base Plus, the most common letterpress ink, through our supply division. You can purchase any of the Pantone base inks or else order a special mix if you have a custom Pantone number. The only drawback is that you have to buy a pound at a time, which is probably a lifetime supply for an L Letterpress. NA Graphics sells ink in 1/4 pound tubes, but as you can see they’re more expensive by weight. They are less expensive than the QuickKutz inks (which are only a quarter of the size of the NA Graphics tube), and I know NA Graphics wouldn’t sell bad ink. I plan to follow up this post with another one about inking, and I’ll address inking options and techniques in more detail. What about paper? What else can we use besides what QuicKutz sells? And where can we get it? Gloria: Any paper can work for letterpress, but thick, soft cotton papers show the impression best. In general, make sure you’re ordering paper that’s cotton cover stock and more than 100 lbs paper weight (that’s just a term that we use in the US to describe how heavy the paper is, so a higher number usually means a thicker paper). Letterpress printers often use Crane Lettra for their printing, which is available through many commercial paper merchants. Unfortunately this may not be practical unless you want to purchase many large sheets of paper–commercial paper merchants usually expect minimum orders of several hundred dollars and probably won’t cut sheets down from the 22×30 inch parent sheet size. The good news is that Reich Paper just came out with a terrific alternative to Lettra called Savoy. I see that Paper Papers sells the Savoy in small quantities to the retail market. They also list other Crane paper, and you might have fun with some of the colorful papers in the Pallet line. I cannot thank you enough for this information. I received my Letterpress L starter kit today and wanted to throw it in the garbage after testing it out. I too saw the cracks, the ink smudging, etc. I had purchased a photopolymer plate locally to try out and awaiting a UV lamp order from ebay. I had been on your website several times but couldn’t figure out what plate to buy (it was either the one you posted or the plastic backed one – going with the metal clay suggestion). Now I have renewed hope! I also thank you for all the (other) resources you’ve provided! I was wondering, if you have tried using the Savoy letterpress paper? I read somewhere that it is ‘better’ than the Letra crane paper. Thanks again! OK, Here’s a question … what size ‘bed’ does this thing have? thank you SO much for all the hard work you put into this post. I’m a graphic designer, and I ordered the L letterpress online to dabble in letterpress at home. I haven’t yet received the machine, and in my impatience, I visited a local Paper Source that carries the press to see a demo, or at least see some print samples. When I saw the print samples that were up in the shop, I was pretty upset. While anything that had been blind pressed looked acceptable, anything that was pressed with ink, looked terrible! Registration was a mess, ink was blotchy and not at all crisp, and there was ink smeared all around the outside of the design. I started wondering if the website I’d purchased from accepted returns! This post has renewed my hope! I also bought the press to (hopefully) better understand the letterpress process. I currently design wedding invitations/programs, etc.. but one day ; ) would love to have my own (insert great old vintage name here) press. Not necessarily for production,(I like sending work for clients out) but for my own personal use. Finances and space don’t permit for that at this time, so I think this might be a way for me to get my feet wet! I’m in the Boston area; I’m wondering if you know of any good places in this area to learn letterpress? I’m so fascinated with the finished product; I would really love to learn all I can about what goes into the creation of letterpress! Also, a quick thought after reading the comments on inks. Since most people who bought the L letterpress probably don’t need the enormous amounts of ink they’d need to buy commercially, maybe that’s an additional product you’d be interested in offering? Smaller quantities, of a good quality ink – in a good range of colors? I have no idea if re-packaging is even an option for you, I don’t know how messy it is or how it would work, but if it would work, I’d bet there would be some interested customers! Katherine McCanless Ruffin, Wellesley Book Arts Program Director, is on campus part-time during the academic year and may be contacted at kruffin@wellesley.edu or 781-283-2130. Hello, this is Mark from Envelopments. I want to thank Boxcar for their approach to reviewing the L Brand Letterpress and offering their insights. We have been waiting for years to see this tool come to fruition as we had collaborated with QuicKutz (parent company of the L Brand) on how to evolve their die cutting tools for application in the stationery market. I also appreciate Boxcarâ€™s honesty in first acknowledging their apprehensive concerns when the L Brand Letterpress tool was first announced. As with any new tool, there will be skeptics from the reigning masters of the craft. I can just imagine how the Scribes felt when Gutenberg hit the scene. And as it is with any craft, art form or product, there will always be different levels of qualityâ€¦just look around at the various â€œrealâ€ letterpress printersâ€¦not everyone is a Boxcar. With all the chatter online about the ability for an at home table-top letterpress, it looks like the desire is absolutely there. Now with professionals like Boxcar jumping into the mix of this consumer product we can expect to see an appreciation for letterpress growâ€¦even more. And thanks to QuicKutz who had the insight to design their tool around the specs of polymer plates in the marketplace. With the ability to make custom plates for the L Brand letterpress the boundaries have been removed from the mass produced plates provided. The opportunity to personalize artwork and designs will help the use of this new tool flourish with the creative community. Boxcarâ€™s approach to informing the public and sharing their depth of knowledge will be welcomed by manyâ€¦particularly those who want to learn and explore as well as the recipients of a beautiful letterpress creation from the hand of someone they know. First Harold – THANK YOU!!!! Second Cassie…. you don’t have to buy the whole thing…. you can buy a different die-cut machine or the Epic…. I have heard some less than impressive things about the Epic but haven’t used it myself. I use a Sizzix Big Shot & LOVE IT! In addition to having the potential to do this, you can die cut & emboss with many vendors’ plates. I would suggest a trip to your local scrapping store (not Michaels etc. but a purely scrapping store) for a demo of their options. After you have a machine you can then buy the starter kit – comes with all sorts of stuff you won’t need but I think you probably would want the cutting platform… I have been debating trying without but doing 2 colors would be impossible without it I think (no way to line up your paper etc). I’m still debating – but SO happy there are alternative ways to get plates! Wow. Thanks for sharing your techniques to the world. You have prevented me from hours, days and weeks of banging my head into the wall in frustration. And I haven’t even bought the darn thing yet! Hi. I am really pleased I found this post and yet still very confused. I would really love to have a go at letterpress and I say that as a complete novice who is a crafter looking to make more impressive cards/scrapbooks as gifts and for myself. The cost of this tool is really a lot of money to me so I don’t want to make a purchase I would horribly regret.Please could you advise me, in your honest opinion, if it is worth me getting one of these things. I’ve been so excited since I heard it was coming out but everything I read is disheartening. Thank you. George’s Mum: It’s hard to say because it really all depends how much effort you want to put into it. I tried to keep from being disheartening in my review, because it IS possible to do nice printing with this machine with a bit of work. It’s just important to keep in mind that you might not get good results you like right out of the box. If you’re looking to get nice letterpress printing, expect to put a little more money and a lot more time into the project. If quality isn’t that important to you, the machine might be fine as is. I just don’t want anyone to think that the machine makes letterpress easy. 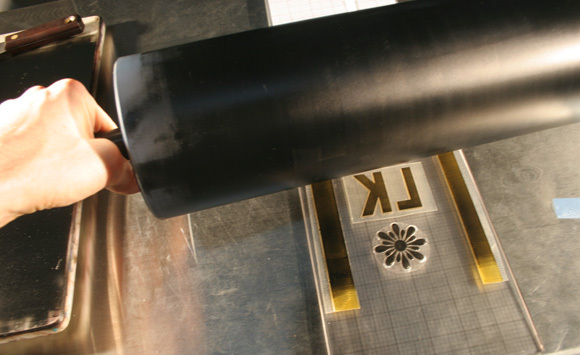 Letterpress has required specialized craft techniques for over 500 years and it’s not like QuickKutz has made letterpress any easier! As far as the machine being expensive…bear in mind that used tabletop presses sell for many times the retail price of a new L Letterpress. So I do credit QuickKutz for bringing a relatively affordable machine to the market where previously there was no similarly-priced option. I hope that helps! Good luck and I hope we can help you if you decide to make the plunge! Hi! I thought I’d add a note for anyone (including you Harold) who is having problems with their dies cracking… from talking with a friend of mine who works at a scrap store, QuickKutz had problems with quite a few Epics when they first came out & the problem resulted in cracked dies….. contact QK – you have a defective machine & they are fixing the problem. The dies should never crack. Heather: Great to know. It seemed to me that the dies/plates are defective and not the machine, right? Well in any event it’s nice to see that they’re standing behind their product. As a manufacturer myself, I feel their pain. I suppose I’ll contact them this week to see what they’re offering as a replacement…or has anyone else an experience to share about the replacement plates? Harold, you are at saint! And at Christmas time! I am part way to not crying every time I pull this out. I went and bought a professional grade brayer today. And yes, I will be ordering plates from you. I am a complete novice, though, and don’t know anything about Illustrator, or other programs. I guess I will be learning about that in the near future. It’s a shame about the plates because it sounds like QK will have a neat custom program that is very user friendly. Anyway, I love that you were so passionate about letterpress and were fearful this would taint the art. No tainting, some of the admirers (who are full time Scientists with two children and a husband that works 80hrs a week) just want to dabble and prepare for when we have time to do “the real thing”. Thank you so much for posting all that. I’m a letterpress lover, the art, the craft of it, and the product of it. I’ve got the L Letterpress on my Xmas wishlist. Though frankly, I wish I have the time/money/space to get a real one. I’ve taken classes on real letterpessing and when I went to the Archivers for a demo, I can tell the quality is nowhere up to par. However, as Harold and many have said, for someone who can’t afford it but want to play with it, this is a good solution. I would say if you’re not a papercrafter and don’t own a diecut machine, get the pack. If you’ve got a BigShot-Sizzix-Cuttlebug-Epic Six type machine, just get the starter kit. Don’t waste money to buy the diecut machine. While it’s good to have a machine that emboss/die cut and now lettpress, it’s all the same. You can go to Splitcoaststamper.com forum and check out their product review. Now, my question is, as popularity gain on this home-version of letterpress, will there be special price point for making custom plates for those of us who are just messing around at home? Though your article is extremely informative, It is very biased. As someone who owned and used a kelsey, the L letterpress is an amazing tool. I would not under any circumstances use their plates, I actually been ordering plates from you guys. But I have been using the roller, paints and all other materials it came with the letterpress kit and even have done two color printing with it and it’s very nice! There is a learning curve so take your time. I think I have spent 60 bucks on paper before I got a decent print. Enjoy!! I am very excited to see these tips and reviews. I bought the L Letterpress and it has been sitting in the box until I could learn about custom plates. I understand the hesitation many in the industry have about the quality of these prints and what this might do to the market on sites such as ETSY. I know that Letterpressâ€™ history is deep, the community very tight, and the art form one of the most beautiful ways to put ink on paper; but I must say a few things. The tone on this blog has been friendlier than many others I have read. I live in a very rural areaâ€¦130miles from the nearest box store and only 4000 people. I canâ€™t even buy underwear in this town. I would have no other way to explore letterpress. With these tips I feel that I could make quality home prints for my friends, family, and to sell at our local Christmas bazaar. I have been a block printer for years and some of my favorite prints have been from potatoes, old erasers, and even cardboard. Potatoes and old erasers cannot be compared to professional screen prints, but nor should they be. They are what they are, but no less of an art form. I view this L Letterpress as a â€œlow sophisticationâ€ way of printing letterpress itemsâ€¦ but that does not mean that my prints will be bad artworkâ€¦ Just like with a potato I am sure I will need to practice with ink application and learn its design limitations before I get a product worth passing on. I donâ€™t see how the 10 cards I can produce could ever threaten a letterpress operation with the capacity and equipment to mass produce quality items. I have no problem stating that I â€œprinted these at home on my craft pressâ€ if I ever do go to sell. If my designs are worthy someone may buy them. Thank you putting out this blog. I contacted you when the â€œLâ€ first came out via your web page and never got a response. I was interested in custom plates. I am very happy to see this thoughtful review and set of tips. I know that oneâ€™s letterpress becomes one of the family. You care for it, maintain it, learn itsâ€™ little quirks. Even though the â€œLâ€ isnâ€™t even in the same league as the old giants I really hope it offers an opportunity for many to express themselvesâ€”even if it is just a potato. Thank you for such an informative and generous post! I purchased an L Letterpress and cannot wait to try a custom plate using my calligraphy. While I would still send out client jobs to a professional letterpress printer, I’m thrilled at the possibility to be able to have fun doing personal cards for myself! I’m wondering … has anyone tried using Gocco inks with the press? I plan on ordering a custom plate after the new year and I’ll try the gocco inks and blog about it. This letterpress is great not many people have the space to set up a huge press in their homes. I got this letterpress for Christmas and I love it. I look forward to printing many things on this machine. Maybe you think most poeple who will buy this are just crafters and not artists but I’m an artist truly interested in letterpress and I feel this machine is perfect. So please dont be a snob, accept the fact that some people will like this machine and thay will make quality prints fromm it and most likely sell them. This letterpress is great not many people have the space to set up a huge press in their homes. I got this letterpress for Christmas and I love it. I look forward to printing many things on this machine. Maybe you think most poeple who will buy this are just crafters and not artists but I’m an artist truly interested in letterpress and I feel this machine is perfect. So please dont be a snob, accept the fact that some people will like this machine and thay will make quality prints from it and most likely sell them. I’m a complete novice to the actual mechanics of letterpress printing, but I have always had a great love of the end result. I’ve recently purchased the L Letterpress so I can have a go myself (don’t have space of money for a “proper” one, although I’m now wondering if I’ll become an addict?!) Your explanation of the process & tips to help improve the end result are much appreciated. Thank-you so much for this information! I have just ordered a starter set and am bookmarking this for future use. To me, watching the demo on TV, the inks looked a bit thick and sticky and hard to apply evenly but a useful tip is that you can use Versafine ink or Brilliance ink with the Letterpress machine. I use both these inks for my rubber stamping anyway, plus they are a lot easier to clean off just with a baby wipe apparently. Wow! Harold, you have been so generous to share this information – and it is obvious to me that you are a true artist – so whatever tool one uses, be it a Heidelberg or a L-Letterpress, it’s clear to me there is more to it than just the equipment! I am a designer and have always loved the letterpress look – and this will allow me to dabble for very short runs and to mock-up and test some ideas. I will be bookmarking this post and your Website – and will be ordering some custom plates soon! Harold, I have taken all your tips and already my results are so muh better. I would love to have a custom plate just so that I could have roller bearers to better ink up the plate. I am using GooGone to do my cleanup–it makes cleanup quick and easy. I then follow up with wipes. If anyone uses the GooGone to clean up, be sure to use quality paper towels so that you don’t leave shredded paper towel pieces behind. I use Viva towels and everthing looks great. Also, I use Scotch double sided tape and my plates don’t move at all. I then use a Slice spatula to lift the plate off. Thanks so much for all your advice. I work at a scrapbooking store and every time I sell a Letterpress kit, I mention your website. Thanks again. I am an energetic graphic designer stuck in the black-and-white world of government pre-press. I’m happy to have a good job, but staring at Pdfs all day until my eyes want to fall out leaves me feeling pretty depressed and unfulfilled. I saw the L Letterpress as a way to finally jump into something that I have always been fascinated with (and have a fair understanding/knowledge about) at a time when my creativity and self-worth could use a boost. When I first saw the L Letterpress online, it was purely by accident. I was contemplating biting the economic bullet and buying a used Kelsey. I was skeptical at first, but my husband was able to talk me into trying the L as a starter. It has not arrived yet, but I am grateful for all of your tips and the resources you provide. Thank You again. you have been an invaluable resource. Has anybody experimented with different types of inks and discovered which one delivers the crispest imprint? Thank you for your valuable information! I recently purchased the L Letterpress and had a plate crack in half (not just the edges) my first go around. The company was prompt and polite about sending a replacement. Thanks specifically for your tips on inking and homemade guage pins. Now if I can just figure out how to prep a file for you, I’ll be a customer of your custom plates! Can you tell me what paper produces the best results? I don’t know if it’s necessary to purchase the card stock sold along with the machine, or if I can find other options elsewhere. Thanks! What do I use to clean the soft rubber brayer? Just soap and water? What do I use to clean your plates to reuse them? Thank you for this great article…it convinced me to take the plunge and order my own boxcar press custom plate. I was hesitant but it came out great. I couldn’t believe how even the finest details came right through in my test prints. So far I’ve only tested on water color paper with some ink pad ink, but I plan to get a rubber brayer and go to town. For others who are looking for paper, I went to the PaperSource and they recommended getting “Luxe” paper, it feels very thick and close to the water color paper I was testing with. I’m glad I re-read the article today so I knew to store my plates in the bag and out of sunlight, I had left them sitting out over night, hopefully that didn’t hurt them! I came across your write up on the Letterpress L and thank you for the great tips you took the time to provide people who have an interest in Letterpressing. I am in the process of waiting for mine to be developed but it is just for my own limited use. However, I do think I’ll be taking you up on the Custom Plates service. Thanks again for the excellent write up. Thanks for this review. I really appreciate it. I’ve been in the invitation design industry for 6 years but have always outsourced my printing. When I heard about the L Letterpress, I thought it might be fun to try and I’m glad to have a resource to make it actually work. Thanks for these techniques and all you do for the industry. Thank you for this article! I was so happy at the prospect of achieving a letterpress finish for my craft but was devastated when I read on that it would not be what i hoped it to be, with my Sizziz Big Shot. This article has renewed my faith, and I am indeed willing to put in more patience and effort to produce an acceptable standard of product. However, as I am based overseas (international shipping is a killer!) and I am an amatuer crafter, I am keen to know whether it is possible to use the Epic that you have in the pictures, or my Big Shot, together with hand carved wood or linoleum type to do letterpress? Will it wreck the machine altogether? Have you guys thought about making a consumer products, sounds as if you have all the answers to L letterpress faults. I was thinking about purchasing one, but quite reluctant of all the extras that I will need to do. Personally, I would like to have everything in one kit. Thanks for the information it was extremely insightful. I just wanted to convey how thankful I am for your review on the L Letterpress. Though it would be a dream to own a less â€˜hobbyâ€™ version of a letterpress machine, I purchased the combo letterpress and epic 6 kit to print my wedding invitations. Iâ€™ve loved letterpress for a long time and when I discovered this as an option to make them myself, I couldnâ€™t resist. I have to admit I was suspicious and even though I got quotes from professional letterpress artists to weigh up my options, the artistic side of me couldnâ€™t resist wanting to produce them myself. In fact it was a dedicated letterpress professional who passed on the link to your review. The wedding is all vintage and the thought of handmade letterpress invitations seemed a perfect compliment. Your review has been extremely useful and your comprehensive website has convinced me to send my designs to you for my custom plates. I too tried the machine with the sample plates it comes with and became completely disheartened with poor results and buyerâ€™s remorseâ€¦prompting a call to the store to see if they would provide a refund. Having read your post I have tried some of the tips already (even without my custom plates yet) and feel there is hope that I myself can produce something of a decent quality. Your honest and professional opinion is much appreciated by someone like me who doesnâ€™t pursue this full time but still appreciates the age old craft of letterpress. Thank you for being a professional that isnâ€™t afraid to cross over and connect into the world of aspiring artists that want to learn and practice such a wonderful craftâ€¦. your post can help some of us dabble in a positive way and who knows may even contribute to keeping the craft alive through the next 550 years. Thank you once again, I look forward to receiving my custom plates. It would be great if you put a kit together in your store of the things we’ll need to make this work. Since I know that I’m a letterpress amateur, I want to make sure I’m buying the proper things. I’m not even interested in buying a letterpress, but got here by clicking on some links from other blogs. Your post is so interesting that I read it all the way through. I think you are so kind to post such a great and informative article to really help others enjoy something you are passionate about. Thanks for your honest feedback and suggestions on the L Letterpress. I have in fact purchased one just to “play” with, but I’m waiting for it to come in. I’m very eager to order a custom plate from Boxcar though. From the looks of it…I wouldn’t and shouldn’t go anywhere else for top quality professional service =) You’ll be hearing from me shortly! I live in the UK and the typical hobby press is an adana rather than Kelsey . Looking at an Epic 6 in a shop I discovered my (very overstressed husband ) used to do a lot of of printing at when he was in high school on the art departments press and really enjoyed it -they were good enough to undertake commissions – I can see this being a family project but I see all the limitations -the letterpress is quite expensive in the uk and I was wondering whether a second hand adana would be a better bet -you make comments on the kelsey but do you have any experience with an adana? Hi, I found your post after I bought my L Letterpress today as I was totally scared to use it without getting more info first. I am a graphic design student and am infatuated with letterpress. I want to be able to use letterpress in my assignment work and presentations and when I found the L Letterpress I was in raptures. You have given me so much information that I am sure to be pleased with the results. After I finish my comment Im going to ‘check you out’ and look at the custom plate ordering info. Tell me though, can I order an alphabet so I can make my own text, or do I have to order the finished product? Can you make plates for logo’s as well? I like everyone else here am a huge letterpress fan. I love the nostalgic look it gives. I have been very interested in learning how to letterpress for a while now and would obviously purchase a higher quality press if they were affordable. I was looking into the L Letterpress but hated the limited amount of printing plates and started to search how to make a printing plate. Two different blogs brought me to you. I am very excited now and plan to go ahead and get the L Letterpress with your modified suggestions. I would love to know more about letterpress, however, I live in Idaho and have not been able to find any type of courses available in my area. If anyone knows of any please let me know. And thank you for the wonderful tips, tricks, & information! I followed your advice to use a soft Speedball brayer. My problem now is, how to clean the red ink off it! Save for a few scratch marks I made where I tried hardest to scrape off the ink with the L wipes, the ink stubbornly clings to the rubber. This didn’t happen with the L brayer and black ink. Maybe the brayer needs to be the hard one after all, but just better quality? I did notice the dry spots you mentioned on the L brayer, which comes from not being perfectly rounded. Or maybe the red ink itself is faulty. I use old aluminum ice trays and old phone books to clean soft brayers. Discard the cube separators and pour in some solvent. 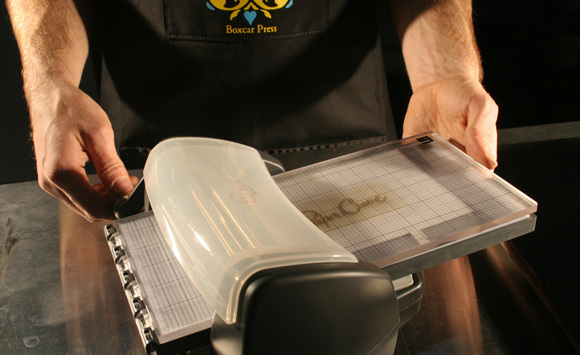 Roll brayer back and forth then open phone book and roll until dry. Open book to clean pages and repeat until clean. p.s. I tried using the L brayer with the red ink still on the ink plate. Maybe the ink was on there too long (over half an hour), but the L brayer didn’t ink up as well as it did with the black ink. Cleaned a little harder with the L wipes. The ink on the ink plate cleaned harder with the L wipes, too. Maybe it’s the pigment or composition of the red ink itself? It’s not even really red, more like maroon, blech. The red ink does not completely clean up off the plates, no matter how much I clean it with the L wipes. The red ink stained the plates. The plate left a faint residue when I attempted to blind emboss. So I inked up with navy ink so as not to waste the card that was ruined. The navy ink worked better than the red. Also, I should mention that the Speedball brayer from my previous attempt had a lengthwise strip on the rubber that resisted the red ink. What do you use to clean up your big rollers? I may need it to clean my Speedball brayer. TIA! Well – after reading all the posts, one one hand I’m a bit disppoointed as I have just gone out & bought the starter kit, some printing plates sets and a few different inks and some paper from the L Letterpress range. I thought I’d get a few tips before opening the box and came across your blog. After reading though, I feel like taking it back to the store for a refund and buying all the above recommended tool instead. On the other hand, I should just go ahead and experiment and when I get a bit better at it, purchase the better tools, ink and paper. So I’m very enthusiastic to get started as I’ve a few birthdays coming up and would love to present the reipient with a beautiful letterpress card. Your review has been very helpful and I ‘d love to get some custom plates & supplies from you, but unfortunately, I’m in Australia and you don’t ship to here. DO you know of anyone who makes custom plates in Australia? Try using odorless paint thinner to clean the plates. You can pour some in a shallow tray and put the plate in there and use a sponge to help wipe it off. Let me know if it works for you! Thank you so much for taking the time to do this post. I purchased an L Letterpress and was a bit disheartened by the reviews. I hadn’t hoped to achieve professional results by any means, but I was hoping for something descent. It seems that with your tips when the kit does arrive I will have that chance. I look forward to reading your follow up post soon!! Valerie, my main problem at the time was getting the ink off the Speedball soft brayer, not the ink plate (the L wipes work well on the plate), but the OMS did work for the brayer (however the white roller is now tinged orange). And just today, I used OMS on the dried up ink on the ink plate, it worked well with hard scrubbing with an L wipe. It left an oily residue, which I just washed off with soap and water. Thank you! Thanks for the blog post – was very helpful! I’m planning on purchasing the L Letterpress and will definitely buy my custom plates from Boxcar Press. Thanks again! I was going to purchase an L Letterpress today and didn’t buy it because the store told me I could not return it if it was opened. I was wanting to know if it would work with my Big Kick so I didn’t have to buy another machine. I am happy to see that others have used the Big Kick and it works. Thank you for your tips on making it work better. If I don’t have the design programs, how would I get custom designs from you? I am definitely interested in buying some from you. I am slowly starting my own custom invitation business and was hoping that this product would take things to the next level. Thanks again for the information. Thank you so much for the post! I just got an L, and have been a bit frustrated. The cheap plates were not only sloppy when using ink, but were leaving impressions from the outside of the plates on my papers. Ugh! I really want to find way a to use this machine in my stationery business. I love the idea of being able to reproduce such a beautiful technique without having to use tons of equipment to do so. I look very forward to reading your future posts about this machine. And thank you for the recommendations! Thank you for your post!!! I purchased the L Letterpress from a craft/paper store and then purchased custom designed plates (I designed myself) and ink from Boxcar Press. I am extremely happy with the results, but it did take a little over 50 prints to finally get my technique down and start printing perfect prints each time. One trick is to spread out your ink as thin as possible on the glass. I had to add more ink about every 10 prints. Another trick is to clean off the glass and your brayer about every 20 prints, or when it starts to print a little blotchy. But the main trick is to have your plates made from Boxcar Press! They were excellent at helping me set up plates for my two-color print. How about some pictures of your prints with Boxcar plates? Can you throw us a link? It’s great to hear someone having some success with the process. Anna, I also noticed a very blotchy ink impression, almost spotty in appearance. Why do you think this is? Having to wash up every 20 prints is prohibitively high and wastes a lot of ink. Has anyone found a solution to this? I am using photopolymer plates, the recommended speedball rubber brayer, a plain glass ink plate, and naptha to clean. Those are the only variable factors I can think of. Oh, and I also live in a humid region. However, I did use a little oil based cleanser a couple times. Could the residue from the oil be causing the beading in the ink? Will Crane Lettra 220 work with the L Letterpress, or is it too thick? Will it break anything? I just got L Letterpress and my plates from Boxcar!!!! They were gorgeous! I tried them out last night but was a little disappointed with the ink I bought. I got 4 tubes of speedball oil based at a local art store a little prematurely only to find out it is too thin. I have looked everywhere and can’t seem to find an ink that works with the L Letterpress. The supplied L Letterpress black ink worked well after I set it out for a 45 mins. But the only way to get that is order it online. Anyone have any suggestions for thickening the speedball or another ink? I used Boxcar plates with my L Letterpress machine to make save the date cards and an invitation suite for my wedding. Thank you SO MUCH for this great tutorial. I don’t know how I would have finished the project without all of your great advice. See some of my results on my blog (http://www.modernlywed.com/2010/11/diy-save-date-cards.html). I wonder if you could use your plates with the die cut machines and not just the letterpress machine? They look almost the same. I have tried printing my lino cuts in the die cut machine and it worked pretty well. Not as good as a regular press and also has big size limitations but it works. Now that I see this I will try ordering one and see if it works. A couple things. Just want to make sure you’re using roller bearers like I suggest in step #3 above. It’ll be hard to get crisp printing without giving the roller support on both sides of the plate. Many things that appear at first like problems with the press are actually problems in the inking. But it also looks like the paper is slapping the plate before printing. This happens when there’s a gap on the plate and either the paper is curled or else the paper gets curled while printing. The paper moves when it’s not supposed to and you need to hold it down and in place. 1. Tape the tail edge of the paper down to the bed with removable tape. 3. This one’s a long shot, but you may be able to fashion a rubber band around the bed to hold the tail in place. I’m worried that it may get caught up when it goes through the press though. What you’re trying to make is called a frisket by letterpress printers. Basically, it’s a tab or frame or slip of paper or yes a rubber band that will hold the paper from moving around during printing. Now there’s also the possibility that it’s slop in the machine causing the problems. That would be trickier. Why don’t you start there and let us know how you fare? Best of luck. Thank you so much for all your tips. I have yet to order my set of plates but I have a couple questions concerning the ink brayers. The 6″ Speedball I bought was not evenly rounded as I had dry spots as well, and for some reason the tackiness of the ink made spreading the ink out on the ink slab difficult (and cleaning too), as a result I couldn’t get the even coverage I wanted on the plates. My questions are: 1) Does the brayer have to be rubber? and 2)how can I tell when I’m buying at the store if it’s evenly round? Also, what’s the weight of the paper you used for the example you did for PaperCrave? The impression seems very deep… just curious. Any feedback would be greatly appreciated. Thank you so much! Thank you so much for all your tips. I have yet to order my set of plates but I have a couple questions concerning the ink brayers. The 6â€³ Speedball I bought was not evenly rounded as I had dry spots as well, and for some reason the tackiness of the ink made spreading the ink out on the ink slab difficult (and cleaning too), as a result I couldnâ€™t get the even coverage I wanted on the plates. My questions are: 1) Does the brayer have to be rubber? and 2)how can I tell when Iâ€™m buying at the store if itâ€™s evenly round? Also, whatâ€™s the weight of the paper you used for the example you did for PaperCrave? Or is that the paper supplied by L letterpress? The impression seems very deepâ€¦ just curious. Just found this post, three days after my first experiements with the L Letterpress starter kit (using with a Sizzix bigkick). Thanks for the advice! Thank you so much for this article, I am a huge fan of letterpress, I love finding quality letterpressed goods and I have been known to just sit and touch them for a good long time! I’ve been interested in delving into this field for a while and while I may purchase one of these little machines to start I think it is going to be my “gateway drug” into the industry, thank you!! thanks so much for the tips. I am an illustrator and designer, and having been printing stationery for a few years now. But my digital and relief printed cards never compare to letterpress. I don’t yet have the money to purchase my own “nice” letterpress, so my fiance bought me the L press until then. I just started inking up the polymer plate I ordered from boxcar, and was not impressed with the quality I was getting from the L press straight from the box–the brayer is terrible, and I should have guessed as much. So I’m so thankful to have these tips to achieve a more professional print. I also respect that Boxcar has embraced the small time crafters and printers that would purchase and use the L press. It will tide me over until I can get set up with the real deal, and after reading this posting I plan to stick with ordering supplies from Boxcar through what will hopefully be many years and many upgrades of letterpress. I am very happy to have found this blog post as I am DIY-ing everything for my wedding to save money. I Haven’t bought the L letterpress yet but am still thinking of doing so. Before I saw your post I thought I would order a custom made plate from Lifestyle Craft, but I am so going to order from you instead now. One question tho, I am no graphic designer, so what program would you suggest me to use to create my design? You mention that all I need is to sand a PDF file to you, but does a PDF file saved from a micrrsoft publisher work? or do I need to create my design via expensive graphic design software like Adobe Illustrator? I am only planning to made a very simple plate with words. Please tell me what do I need to do. After all of the bad reviews the L letterpress got, I bought it anyway. I printed my 1st prints thinking I wouldn’t know what i was doing and expecting to be disappointed. Nope. Turned out that it was super easy to use and the prints were better than I expected – the junky ones that came with the machine. I love it! Using it to make all of my wedding invites. I just posted more of my L letterpress wedding invitation results on my blog (http://www.modernlywed.com/2011/03/our-wedding-diy-letterpress-wedding.html). Thank you , Boxcar, for these great instructions and your wonderful printing plates! Thank you for this wonderful posting. I read it carefully before investing in a L Press for my wedding invitations. I received my plates today and I am excited to print. I did a small test run and the results were just awful. I used a soft rubber brayer but it is 4″ instead of 6″ as I could not find a 6″ one. I also noticed that the ink is really runny and wound up creating really blotchy prints. I will try to order a 6″ brayer online and see if that helps at all. Do you happen to know if it can use Linoleum cuts? Looks like it can’t from the pictures. I adore letter pressed printing, and just bought myself an Epic Six. My interest in Letterpress is as a hobbyist. I would like to try out multiple designs quickly, which makes me hesitant about ordering custom plates. Are there other, less-professional methods I could use for quick results? Are there substrates available that I could simply hand carve and use in the machine? Katie, you could experiment with lino cut materials — if you try them, they shouldn’t be any thicker than .060″ thick to be placed on to the L Letterpress bed. We aren’t all that familiar with linocuts to know their thicknesses, and there would also have to be something to adhere them to the bed. It the thicknesses match, it might be worth a try. We would recommend trying a hobby or art supply store to see if they have any materials that are thin and could be carved or engraved. Because of this tutorial, I ended up ordering plates from Boxcar and loved working with you all! The plates look beautiful! I’ve been having issues with the ink – during prep I couldn’t get it to smooth out, and it seemed almost too tacky. Out of desperation I added a drop of vegetable oil, which is probably not a recommended technique, but it made the situation manageable. Going to keep practicing, but I think I’m almost there! Thank you so much for the thorough review! Based on the thickness of the plates, do you think it would be possible to use linocuts with the machine? Thank you! Sally, it would depend on the thickness of the lino cut material. It can’t be any thicker than .060″ thick to be placed on to the L Letterpress bed. We are not familiar enough with linocuts to know their thicknesses. There would also have to be something to adhere them to the bed. If the thicknesses match, by all means, experiment! Goodluck! Standard lino material works out at about 0.125″ in thickness. Thanks for these fantastic tips!!! I have a printmaking background and was wondering whether you could use printmaking inks? And also whether soaking the paper just like when you are preparing to print on a roll press in printmaking helps the registration or ink and embossing? Harold. I love you. Thank you from the bottom of my heart for sharing. Love that this review has come from a bonafide professional who has been open minded enough to look at something that must seem like a toy to him. You are a rare individual. Unfortunately, I live in the UK so will not be able to purchase custom plates from you and don’t know where I would find anything like that over here. Will have to go on a hunt. Harold, Thank you very much for your post. Recently I saw a new Letterpress printer from FISKARS, the Fuse Creativity System. I’m very interested because the opening is 12in instead of 6in that the L Letterpress has. And this is perfect for the little projects I have in mind. So do you think I can order my custom plates from you guys and use it with the Fuse Creativity System? I haven’t used this machine, but I see that they have an “adapter plate” that allows you to use plates from the L Letterpress. I think most of the tips for the L Letterpress would apply to the Fuse Creativity system, and help you get nice printing out of it. I think going larger is always a good idea for letterpress, in general. If you do purchase one let us know how you fare! Harold, first I wanted to say thank you so much for the tutorial. I have purchase the L Letterpress system and this tutorial really should be a must for all to read before opening the box. Like many here, I really love letterpress and hope to get the big guns in the future, but for now this is really a great little stepping tool to learning a little about the craft. One thing I wanted to know though, I would like to create my own business cards ( thought it would be a great small little short run gig) but I would also like to do a custom die cut. Do you know of any companies that I can order a custom cutting die that will work with this machine? I have been researching and so far I haven’t had too much luck. There has to be somewhere that you can get custom dies, even if you have to retrofit parts of the machine and what it uses. Any help would be greatly appreciated. Also once I get my designs all hashed out, I would really like to place an order soon for a custom plate.. Thank you for the tips, it gives more of an insight from a professional point of view. I was thinking of investing in this machine & luckily I ran across your article. I have a question , since I’m a little on the super super tight budget but I do want a letter print quality invitation.. Would it be possible to achive a decent letter press outcome with your company’s photopolymer plates but using a cuddle bug machine? I would really appreciate it if you had any advice for me. Yes! You can indeed create decent letterpress invitations using the DIY Cuddle Bug Machine. A similar style press is the L Letterpress. which we know quite extensively. Make sure you familiarize yourself with the tips in this blog post. 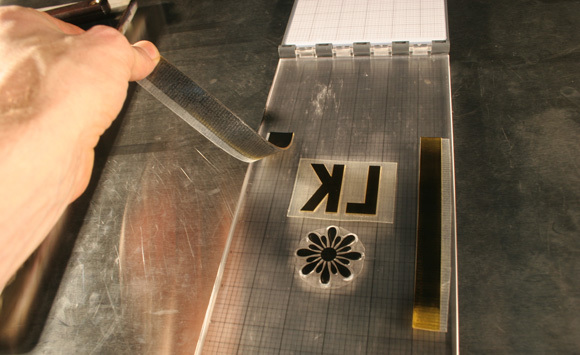 We recommend that you order the KF152 plate type and ask for “inking roller bearers strips”. If you have questions, one of our friendly + wonderful pre-press specialists can help you out – just email cathy.smith@boxcarpress.com or rebecca.miller@boxcarpress.com. Happy printing! Thank you for publishing this page. Very helpful hints! Here’s another interesting suggestion during the clean up phase. If you are using oil based inks, you can use canola oil from your kitchen if you don’t have Goo-Gone. Everything cleans up nicely and looks like new again. Even my brayer wiped up and looks like new again. Hi – thanks for the excellent information. I have several printing “blocks” (metal face nailed onto wood block). Can I use these with the L press if the spacers on the sides are the same height? That is a good question. The spacers will dictate what you can put through the machine. I suspect your wood blocks and paper might be too thick but I would encourage you to experiment (I will try it too). Questions to be answered are: will the open gap be tall enough to hold the block and paper, how to ink and place your block onto the paper, how to push your block and paper through smoothly. My thought is you would need to place the paper on something firm and hard that will slide, place your block face down but how do you have all this go through the machine. So my answer is, I am not sure if this will work and I see some potential problems to be solved first. Let us know how your experimenting works. Does anyone know where to buy the L Letterpress kit? I cannot seem to find them available online. They are sold out or discontinued. Here are shops that still sell it. The machine has been upgraded and is no longer called the Epic 6, it’s now called the Evolution and it’s still made by Lifestyle Crafts which was acquired recently by We are Memorykeepers. The L Letterpress part is sold separately. So some of the names have changed a little and they might have to search on new words. Pingback: DIY Letterpress Wedding Invitations | huh-low world! Love that you blogged about this! It was because of this article that I purchased the L letterpress. I have been looking for an affordable tabletop platen press for a couple of months now to no avail. So in the meantime, I have invested in this. It’s just for my scrapbooking projects and letter journals. Nothing mind-blowing. I love the art of letterpress and use letterpress printers for high-end work I do in advertising. Put a nice Cordenons paper together with a 6 color design, and you have a masterpiece that only a professional letterpress artist can achieve. I would never try to sell what comes off this little press as a professional print piece, but for my personal use, I think the L press will work until I find my dream machine. Thanks for all the tips and techniques. Will be trying all of it out as soon as my product arrives.